In a legal case, there are two parties, the plaintiff, and the defendant. In certain cases, the plaintiff or prosecution would be the state where the defendant committed the crime. The state of Florida is no exception. Nonetheless, there are limits as to how the state of Florida may pursue a case in court. The Florida Statute of Limitations stipulates these limits. These limitations are expansive in coverage, stretching from time limits to limits in conduct. However, this piece provides an overview of the Statute of Limitations, expounding on the parts that have more appeal to residents in Florida. With that said, the starting point is to know the time constraints of the state when filing a charge. This is obviously important, because if these constraints are exceeded a charge may not be pursued. Without munching on the legal lingo of the Statute as regards timing, two dates are important. Staying within the confines of the timing limits is the first hurdle for the state during a prosecution. The second hurdle is typically the focus or reason for raising a “Motion to Dismiss” by the defense team. In the previous section, the table provides a summary of timing deadlines associated with common types of offense in filing an “information”—the first of the two important dates discussed early. This section discusses the second date—time limit within which the State must execute the warrant. If the State does not do so within the stipulated time limit, the charges brought up will be dismissed. The only thing close to a stipulated time limit within which the State must execute the warrant in the Statute of Limitations is the clause, “without unreasonable delay.” In plain terms, the State must execute the warrant as soon as possible after filing an information. If for any reason there is a delay, the delay has to be “reasonable.” Non-specific terms and clauses, yes: To allay the opaqueness however, it is up to the courts to ascertain if the delay is or is not reasonable after thorough examination of the details. Typical factors the courts weigh include the diligence of law enforcement agencies in their search for the defendant, or if the defendant was not in the state after information was filed. Weighing the diligence of law enforcement agencies in their search is perhaps the weightier factor. This is because the courts typically insist that the State provides proof that a diligent search was indeed made, rather than make a mere suggestion that it would have been difficult to find the defendant if a search had been made. The courts definition of a diligent search is along the lines of searching through the city directory, the telephone book, vehicle license records, driver’s license records, local utility companies, state attorney’s office, law enforcement agencies, the probation office, armed forces, schools, the prison system, marriage and name change records, witnesses in the case, and relatives of the defendant. If the State provides evidence that, a search was made via these channels and that it was unable to locate the defendant resulting in the delay to serve the defendant, then the court may hold up the delay as reasonable. If however, no such evidence is provided, the charge will be dismissed. For example, in the case Lucas v. State, the State served a warrant 3 years and 11 months after the alleged offense was perpetrated. Within this time, it was shown that law enforcement only made one attempt to locate the defendant. In court, the delay was tagged “unreasonable,” and the case was subsequently dismissed. The conundrum with the implication of moving out of state is in the 775.15 (5) provision. First, it maintains that when a defendant is out of state, the time limitation does not run. Only to establish, in the next sentence, that a cap exists for this “does not run” time—forever has an end, hey! In at least one case, for example the Pearson v. State case, the courts have interpreted the provision in 775.15 (5) to mean that when a defendant is out of the state, the charges against him or her hang overhead until whatever time the state is able to execute the warrant. Thus implying that the criminal charges may hang forever; and therefore ignoring the next sentence of the provision entirely. The majority of decisions, for example the Robinson v. State, Goings v. State, Lett v. State; in contrast take the second sentence of subsection  seriously. In these cases, the courts maintain that the state has no more than a 3-year extension following the expiry of time for executing a warrant; if the defendant is continuously absent from the state. 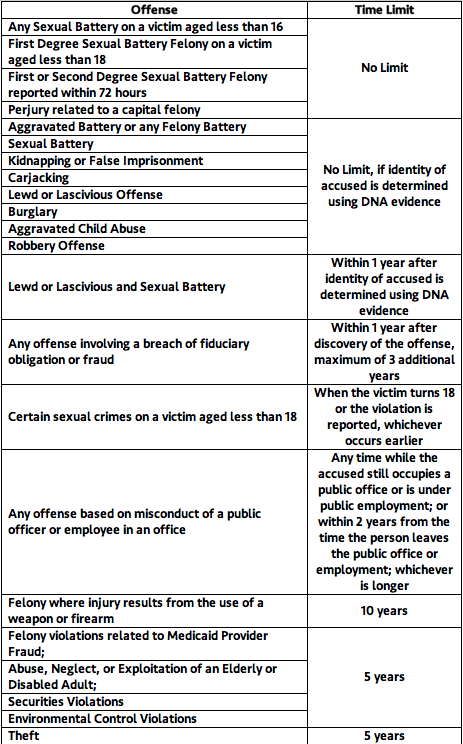 For example, the time limit for filing information for felonies (excluding of the first degree, capital felony, life felony, and felony resulting in death) is 3 years. If an offender who perpetrated such felony were to be move out of the state and the state was unable to track or extradite the defendant; reasonable delay may only run for additional three years. If the defendant were to be brought after this 6 years period (3 for filing information, the other 3 for the extension), the court will most likely dismiss all charges against the defendant—as the Fifth District Court of Appeals did in the case of Robinson v. State. If a court will uphold the first or the second interpretation is hard to know for any case. Therefore, it is in the best interest of the state to execute a warrant within the 3 additional years limit offered by the second sentence of subsection ; in cases where the defendant moves out of or is continuously absent from the state. Better safe than sorry! Although, most courts uphold the second interpretation, the First District Court of Appeals, upholds both the first and second interpretations (though the basis on which either interpretation is applied for a given case is not immediately clear at this time).